A specialist substation support contractor has expanded its business to the North East to support its continued growth plans. 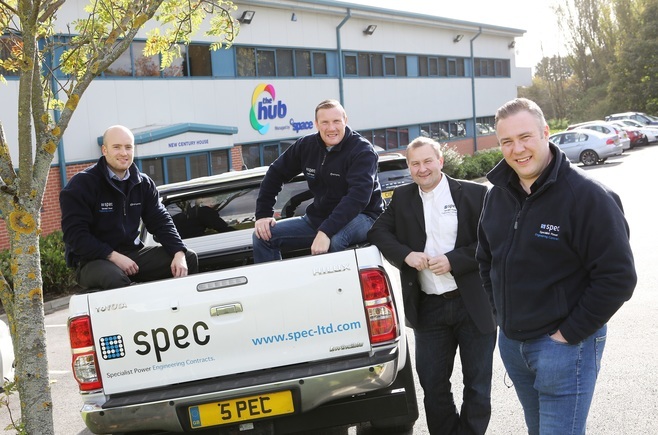 Yorkshire-based Specialist Power Engineering Contracts (SPEC) Limited has opened a new office at The Hub in Washington, Tyne and Wear and at the same time has pledged to create up to twenty new jobs. The company provides specialist services and support including the supply, installation and maintenance of power substations, distribution and networks up and including 66KV. To date, SPEC operate and maintain circa 1600 HV connected sites nationally for clients such as Power Stations, Supermarkets, Hotel Chains, Manufacturing, Renewable sites, Oil and Gas and Industrial. The company employs over 80 staff nationally and saw its turnover reach £12m in the last financial year. SPEC Limited was established in August 2000 and is spearheaded by directors Craig Wright and Ian Needham. Operating from its head office in Wakefield, the company also has offices in Oxford, Aldershot and Lancaster and they don’t intend to stop there. Craig Wright, Power Contracts Director of SPEC Limited, said: “We work with clients all over the world including China, Singapore, African states, Falklands and Trinidad and Tobago but our aim is to firmly establish ourselves here in the UK. We want to grow our business and have a strong regional presence here in the North East and The Hub was ideal because of its excellent location and flexibility to help us grow. Stephen Lancaster has recently been appointed as Northern Sales Manager while William Hair has been appointed as Technical Sales and Project Engineer. The company already has a strong North East presence and works with clients such as Balfour Beatty, Newcastle University and Wiseman Dairies. It expects turnover to reach £15m this financial year end and will be opening its sixth regional office in Scotland next year.